Ok, so maybe 10 years ago we decided to put up a Purple Martin Gourd System at the Goodlettsville location. 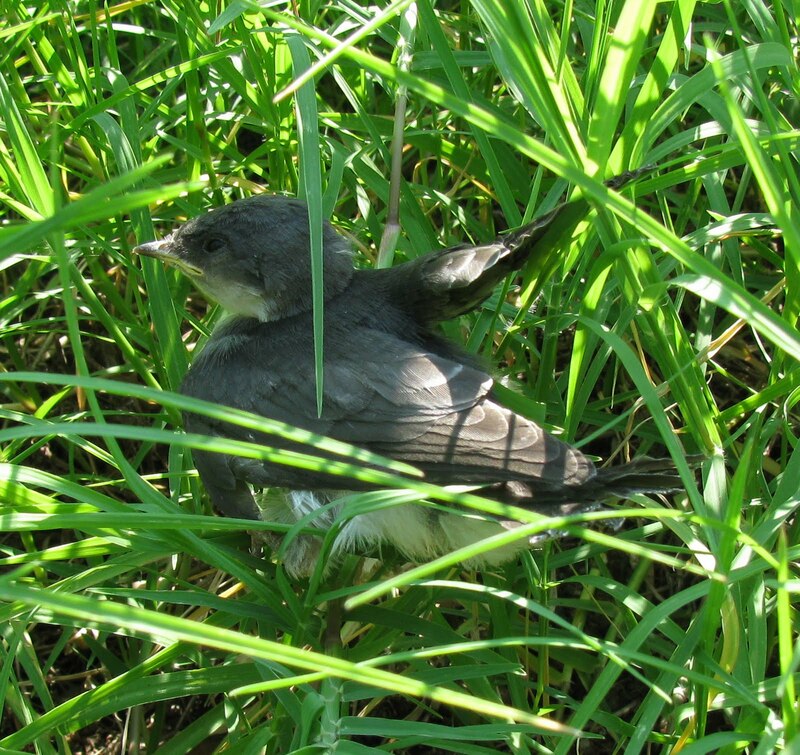 We are right off of Rivergate Parkway, so certainly not an ideal location for attracting Martins; but not so far away - as the crow flies - there are some pretty full colonies, so we were game for the wait. For the past two years, we have seen Martins checking out our system during migration, but never any takers. This year we got lucky! 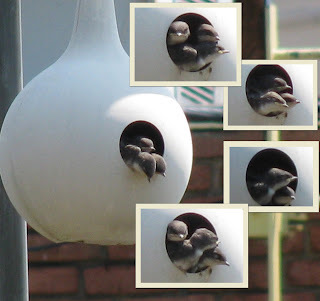 One pair of Martins decided to give our housing a shot, and today the babies were hanging WAY out of the hole watching for their next meal/s. 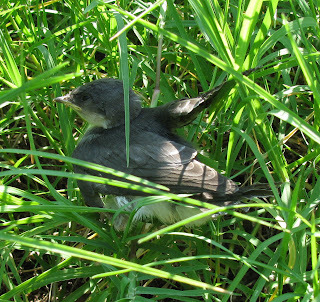 While watching the feeding, I noticed that there was some activity in the - too tall - grass directly below the Martin system.... ohhhhhhhh..... baby Martin. Silly, silly, chick must have fallen out of the gourd - or been pushed out by rambunctious siblings! 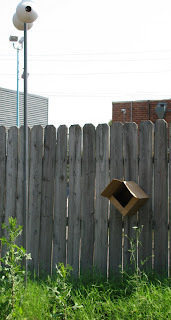 Quickly, I fashioned a Fall-Out Shelter from a box and hung it on the fence, and placed the chick into the box. I then left the premises in hopes that the adults would first, find the chick and second, feed the chick in its' new abode. 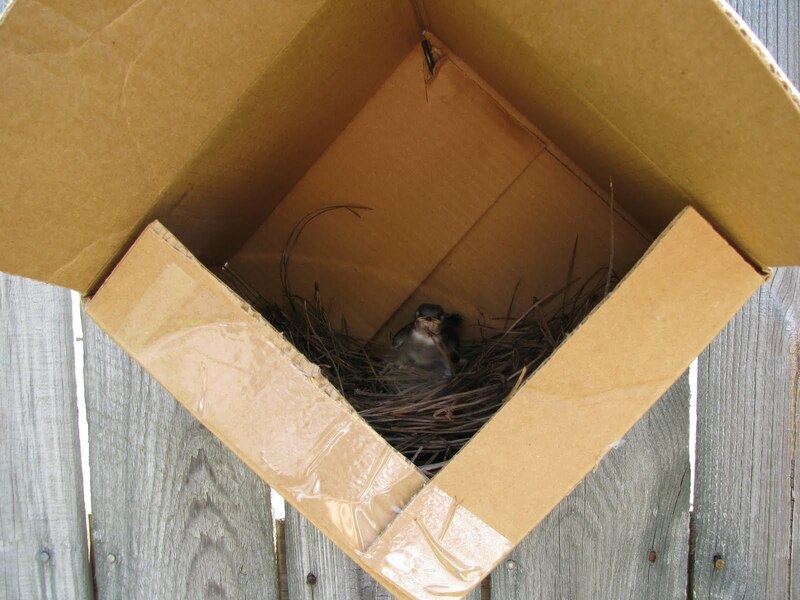 I was pleased as punch to see one of the adults land on the box immediately after feeding the nestlings in the gourd -- but there was no food delivered to our wayward chick. I watched for several more food deliveries, and our chick was never serviced. Being visited is nice, but for a chick, food is far more important. Ultimately, and after discussion with Kent, we decided that I just needed to get the bigger ladder out there and put the chick back in the gourd with its' siblings. This is always the best option for a wayward chick; but if doing so requires the use of a pretty tall ladder, we strongly recommend that you have someone there to assist! All is well now, the adults are being very successful with their hunting on the wing, and we expect these little guys to fledge any day now.